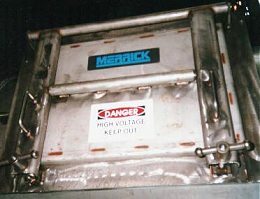 Electrostatic Precipitators | MERRICK Industries, Inc.
MERRICK custom precipitator rebuild on unit handling explosive coal dust. 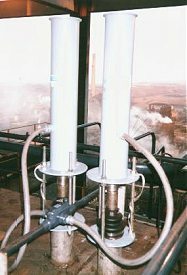 MERRICK specializes in the most difficult precipitator rebuilds, such as the unit depicted on the right. This precipitator was an older rigid frame design. It utilized a single field with internal tumbling hammers. 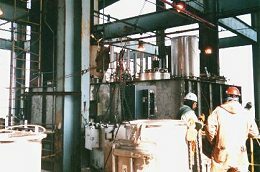 Our mission was to reduce downtime and to reduce emissions from 70+ pounds per hour to less than 20 pounds per hour as quickly as possible. 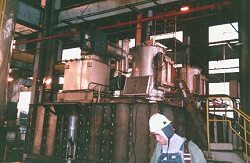 The new MERRICK precipitator came online seven weeks later, utilizing a two field design with rigid electrodes and roof mounted electromagnetic rappers. Test results: less than 4 pounds per hour. All designs incorporate rigid discharge electrodes. Utilize either single piece or segmented collecting curtains for design flexibility. All designs incorporate electromagnetic rapping systems. Intimate knowledge of all existing OEM designs. Dynamic engineering group oriented toward quick paced projects. Ability to place high level consulting personnel on ground level.